Marc Garneau, minister of transport for the Government of Canada, will speak on “Trade, Transport and Space” on Friday, April 5, at 10 a.m. in the Strasser Legacy Room, 220 Eggers Hall. The lecture is sponsored by the Howard G. and S. Louise Phanstiel Chair in Strategic Management and Leadership in the Maxwell School, with support from the Maxwell School’s Campbell Public Affairs Institute. It is free and open to the public. For more information, or to request accommodations, contact Shiron Gaines at sgaines@syr.edu or 202.888.6644. This will be Garneau’s first visit to the Maxwell School. In his presentation, he will discuss his mandate responsibilities for Canadian transportation policy and programs, and the implications of trade policy on the extensive U.S.-Canadian commercial trade transported across the national borders. He will likely have a few thoughts on space matters as well. “Minister Garneau is at the forefront of some of the most pressing public policy and management challenges of our time. We are privileged to host him at the Syracuse Maxwell School for what is sure to be an insightful discussion,” says University Professor and Phanstiel Chair Sean O’Keefe. Garneau and O’Keefe are longtime colleagues who served together as the leaders of the Canadian Space Agency and NASA, respectively, from 2001-05. 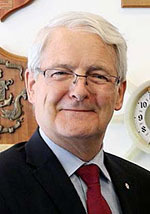 Garneau is a member of Prime Minister Justin Trudeau’s cabinet and a member of Canadian Parliament representing a riding (district) in Montreal, Quebec. His distinguished career began as a naval officer in the Royal Canadian Navy, from which he was selected as an astronaut candidate. 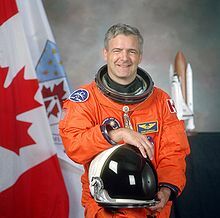 He became the first Canadian astronaut to fly in space as a member of the space shuttle Challenger crew in October 1984. He flew on three space shuttle missions, including a flight to the new International Space Station. He served as deputy director of the Canadian Astronaut Program and executive vice president of the Canadian Space Agency before being named president of the agency in 2001. He served in that role until 2005. Garneau was elected a member of Parliament in October 2008 for Westmount–Ville-Marie. In his first mandate, he served as the critic for industry, science and technology, as well as the leader’s representative for Quebec. He was re-elected in Westmount-Ville-Marie in 2011 and served as house leader in the House of Commons. He also served as the critic for foreign affairs and La Francophonie. He was re-elected in Notre-Dame-de-Grâce–Westmount in 2015. In 2003, Garneau was made a Companion of the Order of Canada, Canada’s highest civilian honor.